Mayberger continues the family tradition of creating art. After studying antique furniture repair and finish carpentry with his uncle, he attended Goddard College and studied a combination of ecology, shamanism, sculpture, and woodworking. 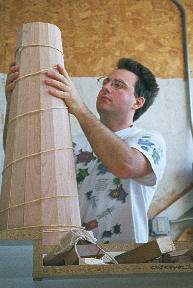 The result of his Senior year at Goddard was the birth of White Raven Drumworks. Now he makes flutes, drums, didjeridus, and music. Kai displays his work at the White Raven Gallery on Route 4 in Bridgewater Corners, VT. If you happen to be passing by, he recommends you give him a call (802) 672-3055 to ensure he will be there when you visit.